Quick disclaimer: This article in no way gives negative ill will towards TFS, anyone that knows me personally knows that for an ALM I truly love TFS and would not give up on it for anything. So the situation I ran into is probably similar to other development teams. Source control is in Team Foundation Server or TFS. When a developer modifies a files that file is automatically checked out of TFS (as long as they are in online mode). In some shops there is a rule of not leaving the project file checked out for any length of time. In fact any file that is checked out for a long time is frowned upon. I have never really dealt with this style of restriction and asking around this seems to be either a growing trend or best practice. Doing what I do best, researching the topic I came across git which lead me to git-tfs. What is git? It stands for GNU Interactive Tools that was created by Linus Torvalds. Git is a free and open source distributed version control system. A distributed control system is where every clone is a full-fledged repository that contain history and revision tracking. The difference between git and TFS is that there is no dependency of a central server. Git-tfs is a bi-directional bridge between TFS and a git repository. Merges are conducted via Git’s algorithms and merge tools which may or may not be better. Check-in history sent to TFS is visible in TFS and workflows can still be maintained. What does this offer up to a developer? The freedom to hold files opened, because the developer will be opening their local git repository. Not having to mess around with moving between online/offline mode. 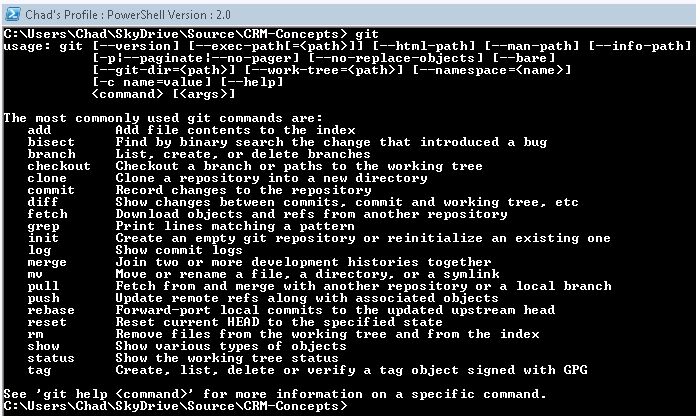 Git Extensions – Great for windows folks, it also does installation and configuration for you. Contains some great links to videos on using Git. If you do not see the above something is not setup correctly, let me know if you need any help. First thing that needs to be done is to create a new git repository that is initialized from a TFS source repository. Run the following command of course replace with the location of your server connection info and projectname. Depending on how many check-ins this project has associated with it this could take some time so be patient. Once this is complete this next step is optional but it does make life easier. Go to the root of your project and create a file .gitignore. This file tells git to ignore any file/folder listed. Add the following lines to the file. (if you are having issues creating this file you can use the new git menu in Visual Studio to edit.gitignore. From here the developer is free to follow two paths. The clone process initialized a local git repository called master. Option two: Can cause some problems because you are working off the local master branch. This has the potential to cause problems if the developer is not keeping tabs on his own master repository, then again this option is probably not much different then what developers are use to. Also in my opinion if this is a clone of a TFS project; this is a branch anyways. This is the option I will be showing because it is simple to demonstrate. Now that this has been explain, once the clone is completed, use PowerShell to navigate to the project folder. git commit -m "check in message"
What will happen by default all the commit messages (from the last push) will be rolled up and placed in the comments area. From here the the developer can associate work items and check-in their changes. If commits are successful all changes will be merged into the master repository. This will check TFS for any other updates and then (in a very minimal description) resets the master branch if something has been changed on the remote server. This entry was posted in Source Control and tagged GIT, Source Control, TFS. Bookmark the permalink.